It’s your basic downtown shuffle, and it’s run by the Knights of Columbus. As always, they did a pretty good job with the food, while making a complete mess of the Finish Line. It’s still fun, though, and I’ll miss it when I’m out of South Carolina. I had considered just running to the event since I live downtown, but where would I put my race packet? Instead, I drove to the event and parked in the St. Phillip Parking Garage. It was unmanned and wide open. After that, it was just a walk around the corner to Starbucks. The King and Calhoun Streets location is at the first floor of the Francis Marion Hotel, which is on the Finish Line. Everyone goes into this Starbucks before, during and after the race each year. It’s a nice location, but of course I prefer my store down the street. As the day progressed and the traffic increased, the drinks were made quickly and efficiently. They have a good crew. 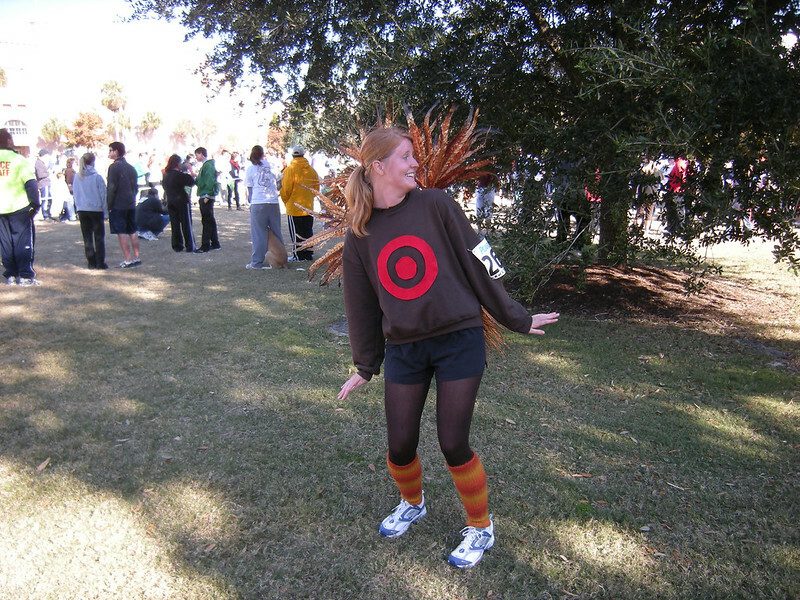 I took a few crowd shots and had a friend take the traditional shot of me in my running gear. John is still having knee trouble, but Monica made it to the event. She’s been getting faster lately, and was eager to pass me. It wouldn’t be difficult to do so, however. I had been training for a marathon, and my primary focus was to learn how to slow down and pace for long distances. As a result, my long runs improved in while my short runs suffered. The crew from my Starbucks came outside to cheer me when I passed. It was wonderful. After I finished I came back to say hello, and found out that one of my fellow baristas was about a minute behind me! I ran back up King Street to the park and looked for Jesse. It was a typical Charleston race. Cold in the morning, hot after the start. I realized too late that I should have ditched my hat and gloves, so I had to run with them in-hand after about a quarter-mile. The scenery was beautiful, but my marathon training has taken me to just about every part of the Charleston peninsula multiple times, as well as a chunk of Mount Pleasant. The Battery doesn’t impress me anymore, but I still enjoy being a part of the crowd. And of course, I enjoy running in the middle of the street. Okay, look at this lady. Look how tight her waist is. Look how fit she is. Young, strong and already walking slowly on the side. She wasn’t favoring a leg or limping or clutching a stitch in her side. All that youth wasted on the young, while a person in their sixties runs right by her. This next photo is the other side of the spectrum. It was taken about 18 minutes into the race. Now, to be fair, I wonder if this kid and his Dad were bandits. It took a while for me to get to the Starting Line, so they could have gotten a big head start. Still, I was passing them near the end of the race. That’s a lot of ground to cover with short legs. I still count him as a much tougher person than that first kid, though. He’s a half-pint, so this race would be more like a 10K for him. You should have seen him move. First of all, I should point out the usual mascots. 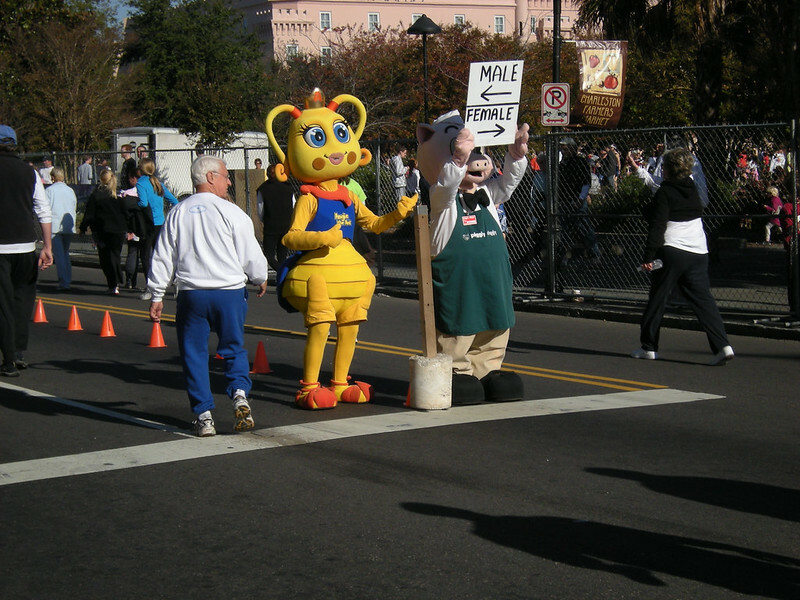 The Pig from Piggley Wiggley is at most of the Charleston 5K events, and Angie the Ant doesn’t miss an opportunity to advertise the next book. That’s fine, because kids like costumes and everybody enjoys it. The problem is the same one that the Knights of Columbus have every year: the Finish Line. Before I explain the problem, I should defuse the usual defenses by saying that no one else in Charleston has this problem. No one. You can see from the photo that there is a finishing chute for men and one for women. Every year, the chute backs up and some fat guy walks across with a rope to divert the next runner into a different chute. There’s no guarantee that there will be a gap between runners wide enough for a slow fat man to cross, so people are invariably halted just a few feet from the Finish Line. Seriously, you actually have to stop. What is that guy doing? Why is he in the way? Where is the finishing chute? What the hell? This happens because they’re horribly inefficient at the Finish Line. They don’t know how to process the people in real time. Again, every other race in Charleston is able to do this when there are no chips involved. It’s only the Knights of Columbus who can’t get their heads wrapped around it. In 2006, I wasn’t very experienced with these events yet, but last year I wrote about this problem. There’s even a video. If you watch, then keep in mind that last year several men ran across with the rope. This time, it was just one guy. One slow, tubby Bubba. Good luck racing for a Personal Record when the Knights of Columbus actively block your path. As with the Reindeer Run, this event tends to have a few costumes. Pilgrims and Indians are a staple, as well as the occasional turkey. In my Flickr gallery, you can even see a cat inside a costumed pet stroller. Go figure. I must admit that I’m partial to the turkey with the bullseye on her chest. She was a little embarrassed about posing for me, but I asked her to pretend that she was looking over her shoulder in paranoid fright. She did her best, I suppose. Since I was only planning to cruise along in this event, I wasn’t too worried about the fact that I was blocked at the Finish Line again. The cheering from my Starbucks crew on King Street more than made up for that.